PEN American Center is the largest of the 141 centers of International PEN, both the oldest human rights organization and the oldest international literary organization in the world. Their Beyond Margins Award is awarded annually to five authors of color for outstanding book-length works published during the previous year. It is presented through the PEN Open Book Program, whose mission is to “encourage racial and ethnic diversity within the literary and publishing communities.” The program works to increase the literature by, for, and about African, Arab, Asian, Caribbean, Latin, and Native Americans, and to establish access for these groups to the publishing industry. The 2006 winners were chosen by a jury of professional writers, editors and educators, out of a pool of more than 130 titles, submitted by nearly 60 publishers. 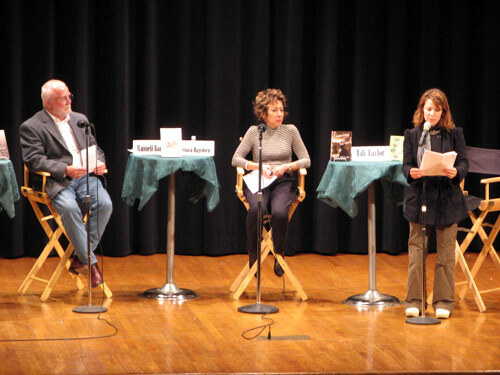 The event honoring the writers was held at the Donnell Library Center and titled “Something to Declare: Celebrating Writers of Color.” The last time I recall being in the auditorium, I was on stage, performing Beethoven’s Sonata Pathétique. These days, I don’t think I’d get past the first few measures. I should try get back into playing the piano more – all those years of lessons! Banks epitomized the older white-haired gentleman author in his tweed sportjacket, jeans and cowboy boots ensemble, so it was interesting to hear Andrew Lam’s Vietnamese immigrant youth experience recounted in his New England tones. 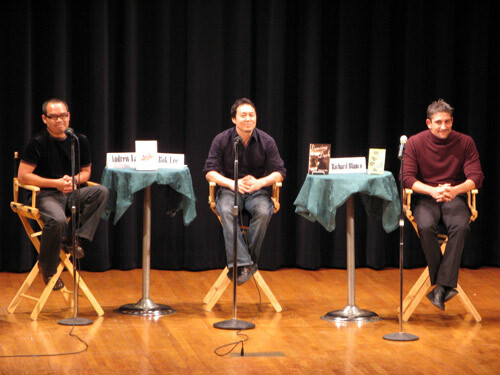 After the readings, three of the authors, Lam (Vietnamese), Lee (Korean) and Blanco (Cuban) participated in a lively panel discussion, moderated by Sanchez, about translating ideas and experiences between languages and cultures. A brief question and answer period followed, during which Sanchez posed questions that she had screened from handwritten cards submitted by audience members, eliminating the almost inevitable ridiculous questions. I would have liked to see some female representation — Tseng was unable to attend — but the men held their own, and seemed genuinely engaged with the audience. There was a small reception afterwards, where the authors circulated gamely among the guests and the stacks of books. There’s something about libraries after hours — libraries and museums — that strikes me as very romantic. The original Winnie-the-Pooh, Tigger, Eeyore, Piglet and Kanga are displayed in the library’s Children’s Room upstairs. Yes, Pooh was a real stuffed bear, given to Christopher Robin Milne — son of Pooh author A.A. Milne — as a present for his first birthday. Eeyore, Piglet, Kanga, Roo (since lost) and Tigger were acquired in that order over the next several years. The stuffed toys have traveled in exhibits around the world, having been kept for many years at the offices of Milne’s publisher. In 1987, they were moved to a glass case at the Donnell Library where they remain on view to the public in their original well-loved condition.